The World of Gord: The Food of Chicago. Many people when they go away enjoy eating at fancy restaurants. We like pub grub. Most people when they heard that Teena and I were heading to Chicago for four days said we had to have a Chicago deep dish pizza. I like thin crust pizza and surprisingly as much as we both enjoy pizza, never had any while away. Our first stop after checking into our hotel was for lunch at Rock Bottom Brewery. I had the Bacon Chicken Mac 'N Cheese. It was delicious, meaty, cheesy and had just a little spice heat to it. I would get it again in a heartbeat. Teena had wings tossed in a hot sauce that she said was just OK.
After touring Navy Pier, doing the ferris wheel there and taking a sunset cruise aboard a tall ship, we went for supper at O'Callaghan's on W Hubbard Street. I had the fish and chips but substituted Onion Rings for the chips. The fish was cod and was excellent. The portions were a little smaller than usual but the perfect size for me that late in the evening. Teena had chicken fingers and waffle chips which she said was fairly basic and just OK. I knew where we would be having breakfast the next morning. About a ten minute walk from our hotel was a Yolk. 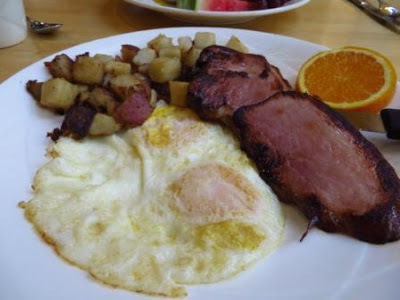 When I was in Chicago last year with with my buddies on a baseball trip, we ate at Yolk a couple of times. The portions are huge. I had Eggs Benedict which came with diced red potato and a healthy portion of fruit. It was fabulous. Teena had two eggs and meat. She chose the ham and it was huge! I would always recommend Yolk for breakfast to anybody heading to Chicago. That breakfast lasted us through a full day of exploring Chicago. 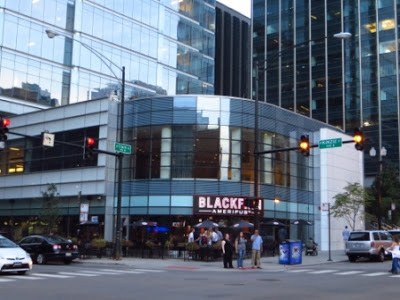 That night Teena and I ate supper at the Blackfinn Ameripub on W Kinzie Street. 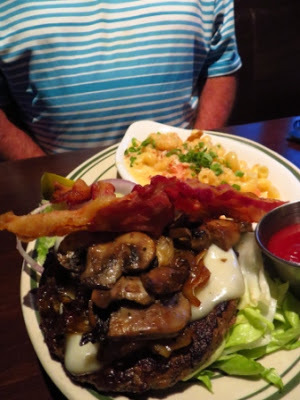 I had the Pub Burger on a lettuce cap with Mac and Cheese on the side instead of fries. Both were excellent. Teena ordered Chicken Parm. She said the pasta was terrific but had to send back the chicken as it had a funny taste. I tried it too and yes, it did. She had the wings instead with BBQ sauce and enjoyed them. 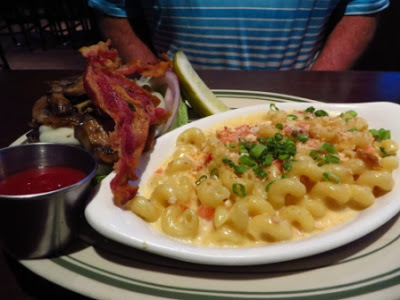 On Wednesday, we headed to Wrigleyville to catch a Cubs game and ate at The Irish Oak. I found it interesting that there were Denver Bronco items all around and the bouncer explained that they are the only Denver Bronco pub in Chicago, which makes sense as all the others are likely Chicago Bear pubs. 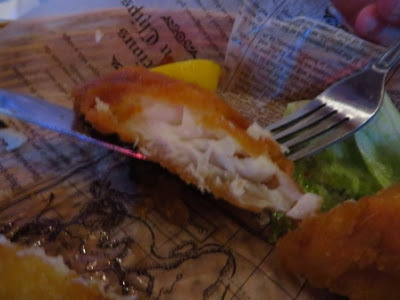 I had the fish and chips made with Atlantic cod. The cod was delicious but the fries came already salted and with way too much salt on them. Teena had the burger, which she said was good, and mashed potatoes instead of fries, which she said was delicious. After the Cubs game, we went across the street and ate ate Goose Island Brewery. Teena had the wings in BBQ sauce. The wings were huge and she said they were delicious. I ordered plain wings and Wisconsin Cheese Curds. My wings were huge too and crispy. The curds were battered and deep fried. I had hoped for a bowl of curds but this was fun to try. It seems preparing them this way takes the squeakiness and salt away. They were just OK.
Before flying home to Toronto today, Teena and I had breakfast at the West Egg cafe. Once again it was breakfast served in huge portions. Teena had Pork Chops and Eggs, which she said were good and would get again while I had a breakfast called the Grabowski. 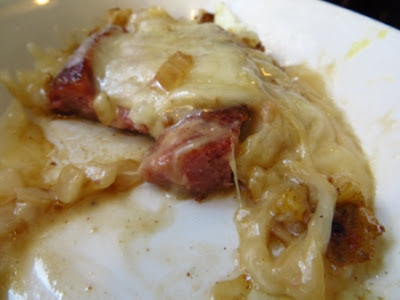 The cheese and onions with the polish sausage was great and I enjoyed the home fires. I would order this again. So you see, Teena and I are not fancy eaters but sure enjoyed eating our way around Chicago.